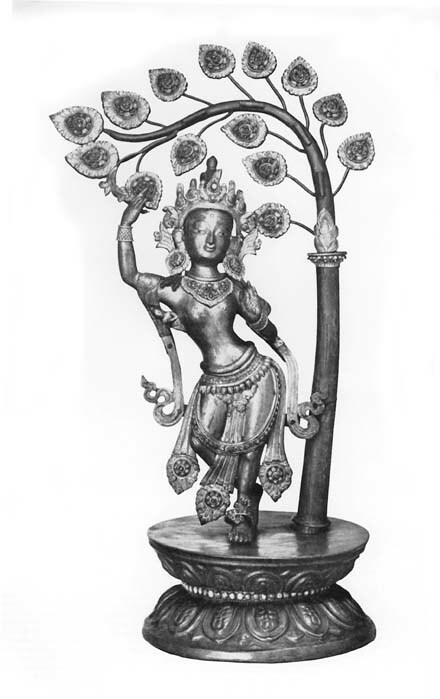 Friends, meet Devi Maya, mother of the Buddha, who is depicted here giving birth joyfully through her ribcage whilst standing on one foot and holding onto a tree. I like to let Devi Maya remind me that being centered, in-the-moment, and happy does not require us to find a perfect life "balance," obsess over whether we are "natural," or do anything "properly." Each of our children is as unique and precious as a little Buddha, and we mothers, too, are unique in our gifts and strengths. There is beauty in asymmetry and strangeness just as there is serenity in the simple flow of regular, repeating forms. It seems that the culture I live in is all about exaggeration and opposition. There is a Right Way and a Wrong Way to do everything, a crunchy hike and a smoothly paved trail, attachment vs. detachment, success against nurture. There are Mommy War skirmishes fought behind the front lines of a War on Women. But this mother, both toughened up and softened by two and a half years of pregnancy and mothering, believes that most of our culture's mothering dichotomies are nothing more than the false trickery of capitalist sales pitches, that most mothers are more compassionate than combative with each other, and that sometimes there is a Right Way and a Wrong Way to do things--but each family has its own unique best interests and its own best paths to them, usually somewhere in the quiet spaces between the extreme methods packaged and sold as news stories and parenting advice. So I am launching a series of Middle Path Mother posts to share the wisdom and encouragement of a not-quite-new mom who has borne a child right in the center of America, the center of the income scale, and the center of today's socio-political storms. Each post will raise a topic relevant to the first Trying-To-Conceive moments through pregnancy and childhood, adding a few grains of salt and a spoonful of sugar to satisfy a mother's cravings for both reasonableness and celebration in this dance of life. Stop by The Magic Nutshell on the first Friday Monday of each month for a bite.